Andrew Davidson graduated with an MB in 1916. Andrew Davidson was born in Govan in 1892, and was the eldest son of Charles Davidson - a blacksmith - and Kate Davidson. Andrew grew up with his siblings Charles, John and Mary at their family home of 102 Camperdown Road, Scotstoun. 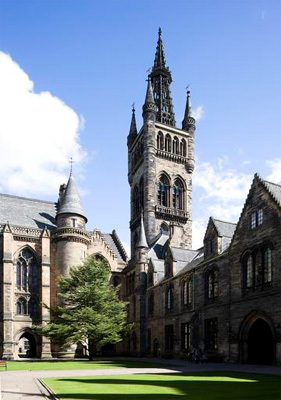 Andrew began his studies at the University of Glasgow in 1909, where he enrolled to study Medicine. Andrew was not only clever, however - he was also sporty, and in April 1913 was signed by Celtic FC. Between classes in subjects such as Maths, Natural Philosophy and Chemistry, Andrew was given a handful of first team chances. In May 1914 he joined St Mirren, and in September 1914 he enrolled to study Midwifery and Clinical Medicine. Clearly a talented scholar as well as player, he graduated from the University in 1916. Now a qualified doctor, Andrew joined the Royal Army Medical Corp, and served as Captain Davidson. While Andrew survived the war, his younger brother Charles was killed in 1917. After the war, Andrew was Regius Professor of Physiology at the University of Glasgow between 1919 and 1921. He entered public health work in 1921, until he moved to Surrey in 1928 upon being appointed deputy county medical officer of health. He was made honorary physician to the King between 1944 and 1947, and was knighted in 1946. In 1954, the University of Glasgow gave him an honorary LL.D. Andrew was married in 1922 to Helen Edith, with whom he had two sons. Born 12 March 1892, Scotland.